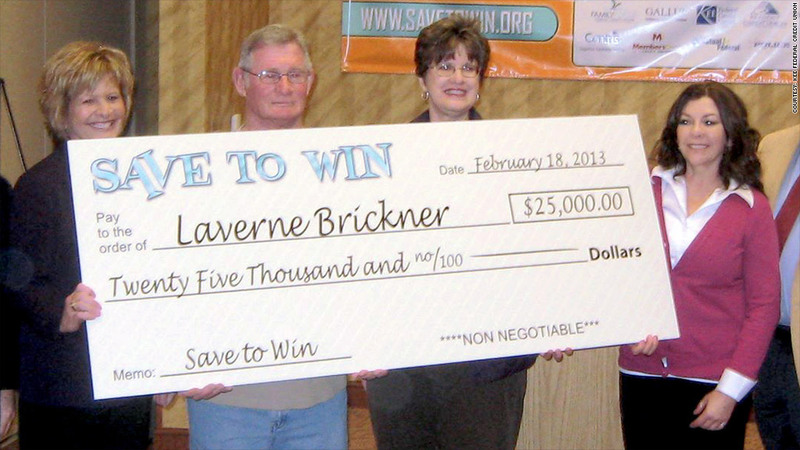 LaVerne and DeAnn Brickner won $25,000 through their prize-linked savings account. Click the image above for more stories from winners. DeAnn Brickner dropped the phone on the living room floor when she got the call last January telling her that she and her husband, LaVerne, had just won $25,000. The couple had bought a handful of lottery tickets throughout the year, but it wasn't a Mega Millions or Powerball official on the phone -- it was someone from their local credit union. "[My wife] just stood there in shock ... I had no clue what was going on, I thought someone had died," said LaVerne, who is from Kearney, Neb. "We went to bed that night going, 'Wow, tell us this again when we wake up in the morning to make sure we're not dreaming.'" Across the country, states are passing legislation allowing credit unions to offer prize-linked savings accounts, where customers are entered into a lottery and given the chance to win an annual grand prize of up to $25,000. Related: I won the savings account lottery! It all started in Michigan. Unlike most states, Michigan's law already allowed credit unions to offer games of chance, like a raffle or a lottery. In 2009, eight credit unions in the state began offering prize-linked certificates of deposit through a program called Save to Win. Since then, the program has grown its fleet of credit unions to 58, and the average savings account balance has increased from $734 to $2,873, with the majority of customers rolling over their 12-month CDs from year-to-year. That success has led other states to take notice. In addition to Michigan, six other states have passed laws allowing credit unions to offer prize-linked savings accounts, according to the Doorways to Dreams Fund, which helped launch the Save to Win program. Connecticut is the latest to do so, passing legislation last year, and a New York bill is expected to be reintroduced this year. And while federal law prohibits banks from running lotteries, a new bill introduced in Congress in October would make it possible for these institutions to offer prize-linked savings accounts in states that also permit it. Here's how it works: When you sign up for a 12-month CD and deposit at least $25, you receive one ticket for the lottery. Every $25 you add to the account after that qualifies you for another chance to win -- up to a maximum of 10 chances per month. But if you dip into that CD before its maturity date, you're typically charged a $25 fee, and you're only allowed to withdraw money once per term. Individual credit unions hold monthly drawings where you can win small prizes of $50 and up, and then there's an annual lottery run by all participating credit unions in the state that selects the grand prize winners. "When [participants] find out they get a prize, they are just ecstatic because most are hardworking, middle-class people," said Dave Adams, CEO of the Michigan Credit Union League. 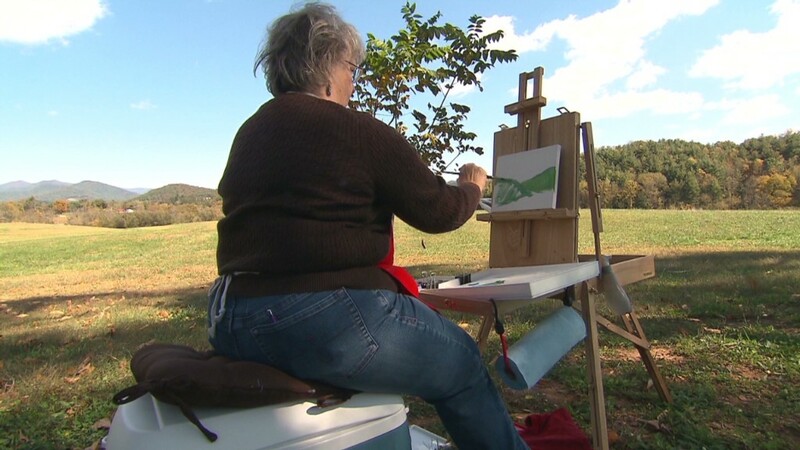 "These accounts are not geared toward people with lots of money, they're geared toward people who aren't regular savers." In a recent survey of Save to Win members, between 42% and 59% (depending on the state) described themselves as "non-regular savers," and between 35% and 55% said they earned less than $40,000. Prize-linked savings accounts operate differently depending on the state. In Michigan, the credit union pays a subscription fee of between $1,000 and $10,000, which is pooled in order to pay out 10 annual grand prizes of $10,000 each. In Nebraska, there's only one grand prize winner per year, but the prize is $25,000. Since 2009, credit unions have doled out more than $1 million to more than 10,000 Save to Win customers -- with 22 people winning $10,000 or more. What's in it for credit unions? More deposits, and more loyal customers who may begin taking out loans or opening credit cards, says Adams. Between 55% and 75% of Save to Win customers said they are more likely to use another product at their credit union after using the prize-linked saving account. Overall, more than 40,000 Save to Win accounts have been opened and $70 million has been saved through the program between 2009 and 2012. Meanwhile, a recent study from the National Bureau of Economic Research found that prize-linked savings accounts do indeed lead consumers to save more than a regular interest-bearing account. It also found that the product appeals most to men, consumers with low bank account balances and lottery players. More than 60 credit unions have also taken the initiative a step further and partnered with a company called SaveUp, which awards money and other prizes to members who do things like pay down debt. "Interest rates are so abysmal that they're not enough to motivate you to save ... these accounts actually do that," said Joanna Smith-Ramani, director of Scale Strategies at the Doorways to Dreams Fund.